From bed size to wall size any quilt can be beautifully stitched in a quilting hoop. The right hoop will free up both hands for easy quilting. One hand will guide the needle on the top side and the other hand will guide the needle on the bottom side to form beautiful quilting stitches. You will need to learn how to balance the hoop on the edge of the arm chair and the lower level of your lap for support. A hoop is small but mighty. The two-part round frame holds the layers of a quilt together, keep the tension even, and prevent slipping while it is being quilted. A screw and bolt attached to the outer circle are used to tighten the hoop around the three layers of the quilt. The hoop is moved from one area of the quilt to another as you quilt each area. Wing nuts should be substantial and large enough to tighten securely. Once tight, there should be no gaps where the bracket meets the hoop. Make sure the nut and bolt on the outer hoop is securely attached. Examine the wing nut carefully to make sure it is large enough to make tightening a comfortable task. Be sure there are no staples or sharp points that you can feel or see on the interior of the hoop. Once satisfied that the craftsmanship is the finest available, you are ready to choose a size. Hoops range from 10 to 22-inches in diameter; 14 to 18-inch hoops are the easiest for most people to use. Quilting hoops are 1 to 1 1/2 inches deep and have slightly rounded edges; embroidery hoops are only about 1/2 inch and have sharper edges. Don’t confuse the two. 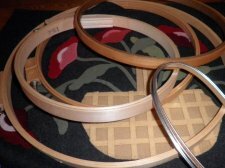 Hand quilters choose their hoops well. 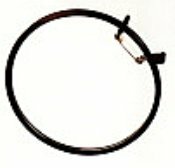 Quality hoops are made to last a lifetime, but they are not cheap. A spring loaded plastic hoop cannot be adjusted for firmness and therefore may not be the best choice suited for hand quilting. There is one thing you can try if you experience the fabric slipping. Try wrapping the inner hoop with bias strips of fabric. This will increase the tautness. 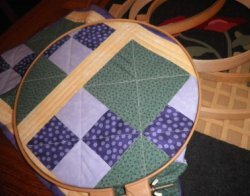 By the way, this technique can be done for any quilting hoop. I can't stress enough how important a hand hoop is when you are first learning to hand quilt so make sure the hoop is the best you can afford to get started. The hoop will last a long time so this may afford you relief when deciding on which hoop to buy. Plastic PVC piping has been developed in recent years for square or rectangular quilting hoops. This newer material is easily snapped together for quilting and disassembled for storage. 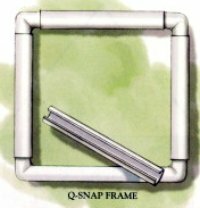 With a new Q-Snap frame, the clamps will be fairly stiff and tight. They will loosen over time. It is important that the quilt is loaded properly. Separate the inner and outer circles of the hoop. Place the bottom or smaller hoop on a flat stable surface. Place the quilt sandwich over the smaller hoop and smooth out all wrinkles as best you can. Place the top ring over the bottom ring. Slightly tighten the screw to apply a bit of tension. You should be able to move the quilt sandwich in the hoop. It may be necessary to straighten the quilt in the hoop and remove wrinkles but make sure you only tug with the straight grain of the fabric. We explain more about the straight grain of the fabric on How to Make a Quilt. Flip the quilt over and gently tug on the quilt in an effort to smooth out all wrinkles. Next make a fist and using a circular motion run your fist around the under side of the hoop to relax the quilt just a bit by creating a little slack. To hand quilt you will learn to bend the fabric over the point of the needle as the needle does not bend. It is far easier to bend the fabric. There must be give and take even with the amount of tightness applied to the quilt top in the hoop. You will find that you can be lulled by the soothing rhythm of your stitching when you learn to quilt. No matter how good the quilting hoop is, you will need to remove the quilt from the hoop at the end of each quilting session. By relaxing the tension created by the hoop you avoid any possible stretching and the quilt will lie flat and ready for you to use quilting stencils for transferring your design to the quilt top.